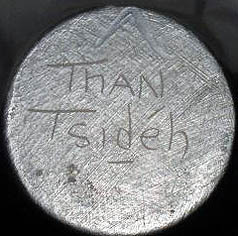 Erik Fender, Than Tsidih (Sun Bird) is from San Ildefonso Pueblo (b. 1970). At the age of 10, Eric began potting with his mother Martha Appleteaf and grandmother Carmelita Dunlap. An accomplished painter as well, he won an award in 1987 in a Congressional Art competition. His interest in color led Erik to experiment with different clays and techniques to achieve new colors on pottery. 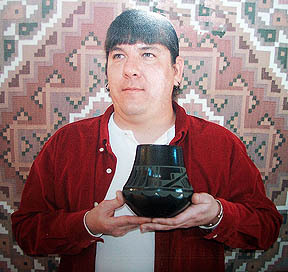 In 1992 Erik began working closely with his mother, Martha Appieleaf, in the traditional San ildefonso style of pottery. Erik Sun Bird displays a wealth of talent in traditional and innovative techniques and received numerous awards at the Santa Fe Indian Market and the Eight Northern Pueblo shows. Recently Erik has been trying to revive traditional San Ildefonso polychrome pottery techniques. Traditional San Ildefonso Pueblo stone burnished polychrome was a technique that was a lost or dying art form. After the introduction of matte painted black and red ware, very little polychrome work continued. Even before matte painted pottery came into the picture, the use of a stone polished cream slip was abandoned in favor of the much easier to use rag polished Cochiti slip. 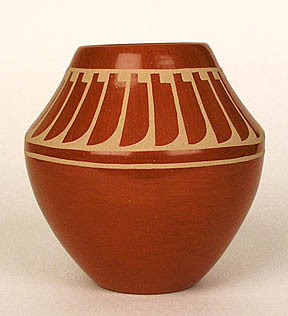 Many people associate San Ildefonso pottery with the very popular matte painted black or red ware. They do not realize that before matte painted ware, traditional San Ildefonso pottery was composed of black on cream ware, black on red ware, and eventually evolved into the polychrome ware. Erik has been experimenting with different materials and techniques to reproduce traditional stone polished polychrome ware. He is trying to perfect the almost lost techniques of San Ildefonso stone polished polychrome ware.